The Interchange™ IB2000 browguard offers the perfect balance of comfort, protection, stylish aesthetics and ease of use. Comfort is optimised through use of a high quality and absorbent Terry Towelling sweatband, which removes sweat and provides wearer comfort without skin irritation. IB2000 features a wide adjusting ratchet headgear to deliver an individual fit and also utilises a foam comfort pad to cradle the head without excessive pressure. 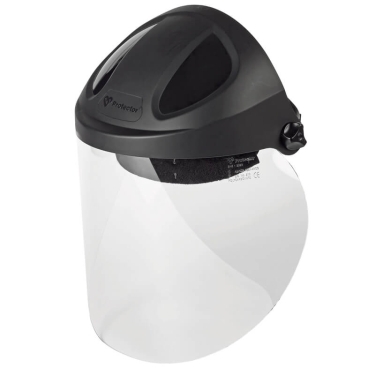 The IB2000 in combination with the extensive Interchange visor range protects against impact, splash or heat hazards; shielding the front and top sections of the head as well as the eyes and face. The IB2000 promotes wearer acceptance through its stylish visual aesthetic. Its uniquely designed flexible hammer-head clips make the fitting and removal of visors both quick and intuitive.